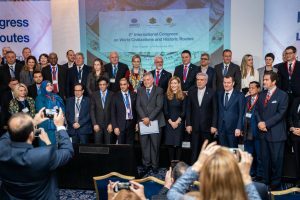 Following the first edition held two years ago, the 2nd International Congress on World Civilizations and Historic Routes (15-16 November) concluded today in Sofia, Bulgaria. In the framework of the European Year of Cultural Heritage and the EU-China Tourism Year, the event explored how tourism along historic routes can help to safeguard and promote tangible and intangible cultural heritage. Organized by the World Tourism Organization (UNWTO) and the Ministry of Tourism of Bulgaria, the congress explored the role of national and regional public bodies in enhancing of historic routes, particularly across nations. It gathered Ministers from four continents, as well as public and private experts representing iconic cultural tourism routes including Route 66, the Way of Saint James (Camino de Santiago), the Phoenicians’ Route and the Silk Road. “Historic routes can play a major role in revealing the unique history, culture and natural assets of territories along them, becoming a powerful promotional tool and a unique instrument to increase tourism competitiveness for many destinations”, said UNWTO Deputy Secretary-General Jaime Cabal opening the event. Nikolina Angelkova, Minister of Tourism of Bulgaria, outlined her plans to advance cultural tourism in Bulgaria. “Cultural tourism can play a key role in turning Bulgaria into an all-year-round tourism destination. We are considering creating an ancient civilizations’ route incorporating UNESCO monuments, which would better acknowledge and promote the Balkan region as a tourism destination,” she said. Discussions centred on identifying best practices in tourism development, management and promotion that can help to harness the tourism potential of historic routes, enhance the value of their cultural heritage, and preserve their authenticity. Successful examples were exchanged of well-developed and managed historic routes, with a focus on ways to maximize tourism’s socio-economic impacts for local communities and contribution to the Sustainable Development Goals. In recent years cultural tourism has emerged as a major driver of demand, in line with travellers’ growing interest to immerse themselves in tourism ‘experiences’ such as local rituals and traditions. The congress produced a useful set of recommendations that can provide guidance to all tourism stakeholders interested in harnessing the potential that cultural heritage routes offer for enhancing the attractiveness and competiveness of destinations. Video recordings of the 2nd International Congress on World Civilizations and Historic Routes will be uploaded early next week.